After reading this post on Babble about things the writer would do differently with a second child, I started thinking about what my list might look like. I have to say, I thought about a lot of things carefully before doing them. I think this was because of a couple of things: having two years between trying to conceive, losing our first baby & Sprout's birth probably gave me more time to think about how I wanted to parent. Being older in the first place (nearly 35 when Sprout was born) probably helped too. 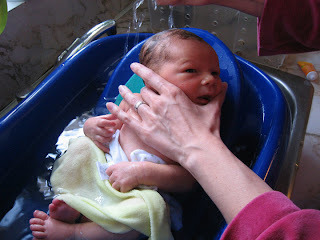 Baby bathtub was useful... like, three times. Buy lots of gear. We tried to restrain ourselves & got a lot of loans/hand-me-downs, but this time we just don't need much of anything. Also, despite avoiding a lot of gadgets, we still ended up with quite a few things that were unnecessary. Try to toilet train because of other factors than the child's readiness. I thought Sprout was almost there back in February, but the main reasons I was trying to train him is that he was going to daycare & he was getting diaper rashes a lot again. (cloth or disposable--it doesn't seem to matter, they cause problems) It didn't work. After a couple months, we backed off & he wasn't ready until about a month before his third birthday. Then he was really ready & it just happened all within a month: daytime control over pee & poo as well as nighttime dryness. Not going back to work for nearly three years. I started to realize after two years of stay-at-home parenting that it was driving me crazy. When I was younger, I never really wanted to be a stay-at-home mom & after a few years of trying it, I can confirm that it's not really my thing. I think staying home after my daughter's birth for a year, maybe 18 months tops will be enough. Worry so much about everything. I like to think I'm a fairly laid-back parent in a lot of ways, but there are still a lot of things I could relax about & hopefully I will with our daughter. I've already relaxed about what I'm eating & drinking during my pregnancy. Last time around I never had a drop of alcohol, would obsess over every ingredient in herbal teas & I never ate anything that was on the no-no list (deli meats, soft cheeses, hot dogs, etc). I'm still avoiding all these things, but I know that the amount of active ingredients in herbal tisanes is very unlikely to have any effect on my fetus, as is a sip or two of beer. Baby Led Weaning. This was so much fun & easier than making purees. The book promised a child who is an 'adventurous eater' & Sprout has truly become that. We can feed him pretty much anything & he really loves a lot of healthy foods. Cloth diapering. It is more work than using disposables, but not much. I feel proud that we only contributed a few garbage bins full of disposables to the landfill, rather than the house-sized pile it would have been if we hadn't used cloth. We have the laundry machines in our house & I have the time to wash the diapers, so it just makes sense for us to do it again. Also: with two kids in diapers for five to six years total, using mainly the same set of diapers, I estimate we'll save several thousand dollars. Putting as much effort into breastfeeding as possible. This time around, if I have low supply issues again, I'm not sure I'll be able to do all the pumping, appointments, gear washing/sterilizing, etc that I did last time around. I'm trying to do as much research as I can & get myself prepared with supplements & a plan to get things started off as well as possible from day one. The birth. I guess getting to the hospital a wee bit earlier would be a good idea (I was fighting the urge to push before we even got in the car) but otherwise, BC Women's nurses & my midwife gave us great care & I'd be really happy to have a repeat of the short, drug-free birth that I had with Sprout. I know I haven't got a lot of control over how it all goes, but I'll keep my fingers crossed! How about you? If you have two or more kids, what did you decide to do (or end up doing) differently with subsequent children? Got any advice for us? I did a post like this during my second pregnancy aswell! For me, this time around I am actually going to try cloth diapering at least part time. I am also hoping to be more relaxed about breastfeeding and do the best that I can instead of feeling guilty if I have supply issues. I hear ya about the pumping and appointments. That probably won't be too easy this time around. Gear wise we have everything we need too-- and I think my ergo carrier is the only thing I really valued the most. The rest is not necessary.